With the worst over by Saturday, people from Maine to Georgia emerged from homes to take stock of damage from a storm that could be more destructive than the rapidly intensifying "bomb cyclone" that struck the Eastern Seaboard two months ago. 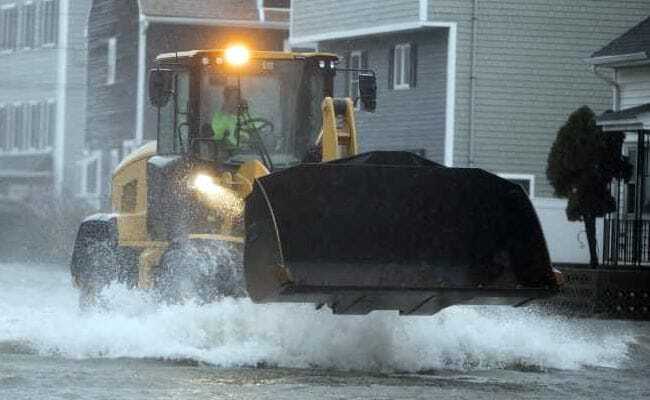 Quincy, Massachusetts: For two days, a deadly nor'easter turned a thousand-mile stretch of the East Coast into a wind tunnel, leaving millions without power, paralyzing flooded cities and towns and claiming the lives of at least seven people. Some of those first glimpses came in the dark. At its peak, winds that got as fast as 93 mph had knocked out power to more than 2 million people, including more than 400,000 in Massachusetts and 320,000 across New York. Thousands of flights were grounded at some of the country's busiest airports, causing a ripple effect of delays and cancellations around the world. On the ground, highways across the Northeast were clogged with tractor trailers and buses, which were prohibited from crossing some of the region's massive bridges due to the treacherous winds. In smaller cities and towns, particularly those near the vulnerable coast, roads had turned into rivers. Although many had heeded authorities' calls to seek shelter or evacuate flood-prone areas, several people died during the storm, which snapped branches and toppled trees onto homes, power lines and cars. The people killed during the storm include a 6-year-old, who died in his bed when a tree came crashing into his family's home in Chester, Va.
A 77-year-old woman in Baltimore County, Md., was crushed by a tree branch while checking the mail, and a 72-year-old man in Newport, R.I., was also killed by a falling tree. Three men were killed when trees fell on their cars - one in James City County, Va., another in Connecticut and a third in Upper Merion Township, Pa.
First responders in Quincy, Massachusetts, spent Friday night rescuing dozens suddenly trapped by rising floodwaters. "I'm fortunate to get rescued," Christine Way-Cotter of Quincy told Boston CBS affiliate WBZ, according to CNN. "Our house is lifted so, like, nothing came into our first floor, but our whole basement is probably six feet underwater." Alp Yokus, 12, and his parents grew increasingly fearful as the waters rose inside their Quincy home before they were rescued by first responders. Because of the dangerous conditions, more than 3,000 domestic and international flights were canceled in the United States on Friday, including complete ground stops at LaGuardia Airport in New York and Dulles Airport outside Washington, District of Columbia. One flight encountered such heavy turbulence that "pretty much everyone on the plane threw up. Pilots were on the verge of throwing up," the pilot said in an urgent report from a regional jetliner from Charlottesville, Virginia. Amtrak also briefly suspended train service because of outages in New York City. In 2018, he's kept the lights on with a portable generator, purchased five years ago, when he thought superstorms and the ensuing blackouts would become an annual event. He put a power strip on the wall, so people could charge their phones and told The Post he was expecting a big lunchtime crowd. "Probably everyone's out now surveying all the damage and in another hour or two, it'll really get going," he said at about 11:45 a.m. "They usually take their beach ride and then come by here to get something to eat." By Saturday afternoon, the highest winds and heaviest precipitation had abated. And high tides were closer to normal levels, instead of wreaking more havoc. Theodore Keon, director of coastal resources for Chatham, a particularly vulnerable seaside town on the southeastern tip of Cape Cod, spent the days before the storm supervising employees hauling in tons of sand. He told The Post the full extent of the pummeling oceanside towns have taken is yet to be seen. "I'm concerned mostly because of the duration of this event," Keon said Friday. "The last two January storms, while significant in terms of water elevation, were of fairly short duration. "When you've got a storm like this that sits off the coast, and you've got the constant pounding of the waves and high water because it's not receding, that's potentially more significant. Three or maybe even four high-tide cycles can really cause a lot of damage." Weintraub reported from Qunicy; Wootson and Wang reported from Washington. Bill Hewitt contributed reporting from Dennis, Massachusetts.